Here we go: another Seagal flick, another donut. Starting with the most generic title you can think of, tons of post-production retooling, and the big man himself, this is not going to be pretty. This is what I scrounged up for a plot: A drug called CTX is being distributed by some unknown force with weird eyes. It's up to Marshall Lawson (Seagal) and his "Attack Force" to stop it. Where should I start? The first thing you'll notice immediately is that Seagal has not done his ADR voice-over work. Almost 100% of the movie does not feature his voice. They got some guy who sounds suspiciously like Bill Pullman to record over the missing Seagal bits. I can't believe Steve is that lazy - to not find the time to go into a studio and record the dialogue HE WROTE! In the first 10 minutes, every time they show Marshall speak, they cut very quickly to another person in the room. If that's not enough, Seagal has the gall to say in the script: "I'm glad you recognized my voice" (?!?). From what I heard, They re-edited this movie three times with two different plotlines: 1. Russian Mafia, 2. Aliens. They already shot footage for both, but Sony and Nu-Image haphazardly put this together to make a quick buck and a deadline. wonderful review site you have here, one of the best. I'm a Seagal fan and even found 'Mercenary For Justice' to be a good way to fill some time but 'Attack Force' is nadir-esque. 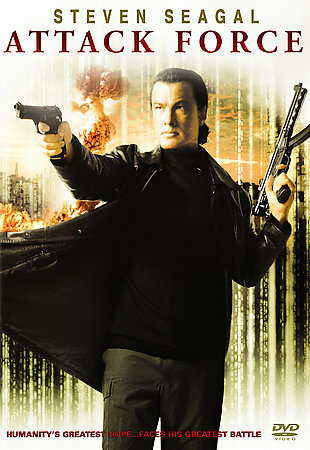 There have been a few cut-and-past Seagal dtv productions but this one does not hold up at all. 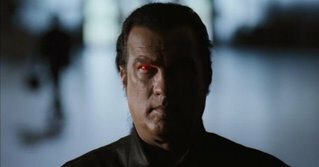 I'm hoping Seagal ends these dtv films with Millenium and Nu-Image and makes a quality film he looks actively interested in. Mike A.
I can't agree with you more! Seagal will (hopefully) get back on track! Thanks for the kind words. I had pink eye yesterday and spent the day at home, which hasn't happened in a very long time. I thought it would be wise to spend it watching some DTV entertainment. I bought this movie as part of an action 4-pack for $1, so I literally spent 25 cents on this movie. It was 24 cents too much. I really wish I would have read your review beforehand, as this could easily be the worst DTV ever made. Why 90% of it was shot in heavy shadows, the Seagal overdubbing (how hard is it to do a Seagal impression, and why would you even need to do it), among other nonsense made this nearly unwatchable. The first three of four movies of his career were stellar, but the last 20 or so were just awful. It speaks volumes when this is the worst of the worst. Hope you get better soon! Very sorry you paid 25 cents for Attack Force. Basically any other Seagal movie is better than this. The Seagal dubbing in this one was especially hilarious though.